Augers are the centerpiece to all ice fishing. Without them, you won’t be able to cut through the ice quickly. They are sold in both manual and automatic varieties. Think of them as a huge drill bit that’s capable of pulverizing ice to form a perfect hole in the ground. There are lots of different types and sizes to these beasts and searching for one can get a little confusing, to say the least. 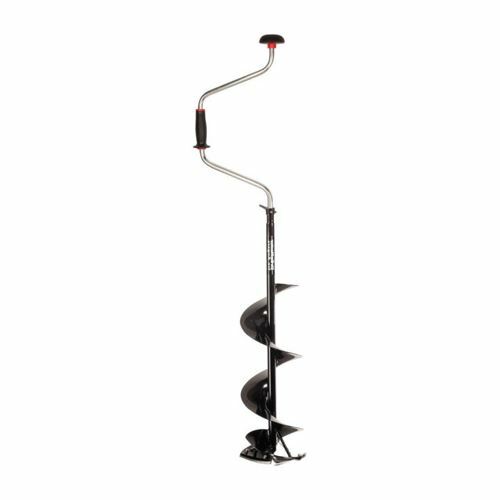 To help narrow things down, here’s a list of the five best fishing augers, picked for build quality and ease of use. Sometimes, the best way to determine what you want is to get a rundown of how each piece stacks up against one another. The comparison table below shows the major features and requirements for each ice auger reviewed. It stipulates whether the piece is fuel or manual, so be sure to pay attention to that before you settle on one auger for purchase. The Eskimo High Compression Auger is fueled with propane. There are only two choices for hole diameter but both are on the larger side. It’s capable of getting through multiple holes in a short timespan. Get ready to tackle the ice without the thought of tiredness or fatigue. And the propane also keeps exhaust low, so if you’re allergic to fumes, this piece will be great (as far as breathability). You will probably need to pull the starter a few times on the first attempt at turning it on, so it’s recommended that you do so prior to getting on the ice. Once it’s on, the startup should go through on two pulls at the most, but usually fires up on the first try. If you need access to the spark plug, you will have to open up the cover. And while the parts are well made, the housing should be handled carefully so as to not damage anything. 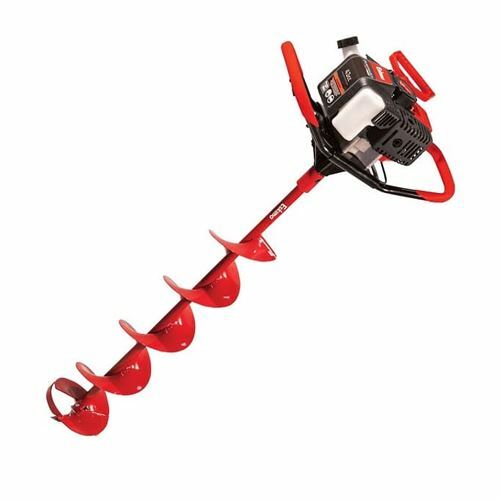 In all, this Eskimo auger exceeds at just about everything one hopes for in a drill, so get while you still can. You’ll thank yourself when you see just how sharp the blades will stay. Generally starts up from just one or two pulls from the starter. Numerous plastic parts on the housing are fragile; must be handled with care. The Eskimo S33Q8 is another product from the same brand but comes in a close second for longevity. One full tank is enough to go around for more than a day’s worth of drilling. It’s highly fuel efficient, owed in part to the twos stroke engine design that requires oil and gas to keep it running smoothly. In action, the motor will cut through the ice like there was nothing frozen from the start. It’s also very quiet, so you won’t risk scaring away the fish that are directly underneath when drilling is complete. But remember to take good care of the blades. Dulling is an inevitable effect of ice fishing, so find yourself a good sharpener to go along with the product. This won’t happen on the first run, so sharpen again once all the work is through. Startup remains easy, and a large handle sits on the cord to help you turn it on without taking off your mittens or gloves. The two-cycle engine produces little noise, even after heavy use. Engine may need to be primed several times in order to start. Many fishers will swear by manual ice augers, and it’s easy to see why. The hand-powered operation can be just as quick as any gas powered tool. The Strike Master Ice Augers Lazer is the right tool when you need something that’s lightweight but won’t get you exhausted too quickly. It can get through many holes without making users tired of the first few that are made. The blades, when upkeep is performed, will last as long as the body itself. And the grips stay firm on the hands no matter how wet your mittens are. You might have to work a little harder though, depending on how dense the ice is around you. This will become more likely as you make your way down to the final inches. The best trick is to simply keep a light but firm press on the drill as you turn. That way, you won’t have to chip away at lingering pieces when it’s pulled back up from the ice’s surface. Although manual, the auger will cut through most holes without requiring strenuous effort. Depending on the model, the blades may dull quickly. The Strikemaster Mora Hand Auger has blades made from dense carbon steel, giving it the ability to slice through the ice at the same speed and consistency as a propane or two-stroke engine. And the best part is how the device can accommodate the height of the user. 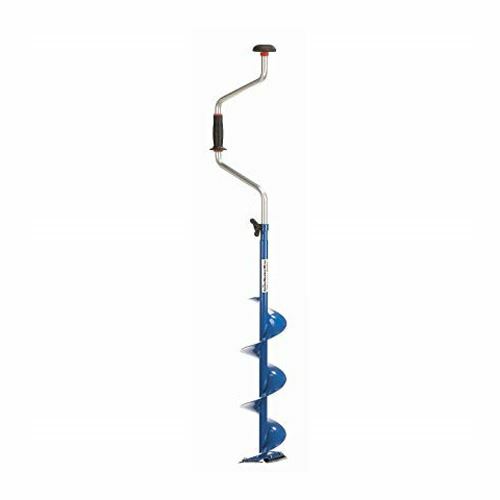 Height adjustments range from 48 to 57 inches max, so if you’re short, this auger is a nice tool to have around when you want to prevent yourself from struggling to initially break through the ice. It also does a stellar job at balance, under the right conditions. You won’t have to move your position or apply hard pressure to the auger at all. Just find your spot, mount the blade’s bottom, and begin your drilling. Handles, or the part you’ll grip, could be a little better at keeping its balance in check, which could become a little annoying when first used. However, you should get used to the holding it up after a few holes are through. Have an ice pick handy as well, it may not always leave a perfect circle. The auger only requires a firm press to get it through the ice; most users won’t break a sweat. Handle performs less than favorable at keeping the device upright on the ice. The final product is the Eskimo Mako Auger, made in diameter sizes of both ten and eight inches. The blades on this one are extremely sharp and will get you through a couple sets without dulling. Unlike other automatic augers that have a choke startup, this one uses a primer. It’s a lot easier to get things moving along as you only need to give it a few presses and pull the switch for activation. But in most instances, the pull switch will be all that you need. One slight issue could be how the auger leaks gas. It won’t happen every time you’re drilling but tends to happen when being turned on. To avoid getting anything on the ice, try starting up the auger before you leave the ground, just to see if anything leaks. Take note that this is an exception, so it’s possible that you won’t ever come across this problem. And the 8-inch hole may be a couple millimeter off but are likely to go unnoticed. Two piece assembly makes it easy for beginners to setup. The auger may leak gas when turned on. If you acquire an auger without understanding how it functions, the chances are high that you’ll end up getting something that works in a way that wasn’t expected. The details below will help clear up some of the classifications of engine type and product features. Manual – Manual ice augers must be operated by hand. There’s no fuel or oil needed so the only maintenance that will be necessary is to keep the parts clean, in particular, the blades. Blade quality is the same as any other auger type, meaning that you’ll have to to keep them sharpened if you wish to use the device for more than one occasion without them becoming useless. The downside is the manual operation itself, which can get pretty tiresome quickly. You will definitely break a sweat with most models. If you think that you might get fatigued as you cut through the ice with a manual, consider an electric or fuel-operated alternative. But it’s a lot easier when there’s help. As such, use a manual when you have a partner to help you with the procedures. Gas – Gas-powered augers are the most popular, and for good reason. If speed is your most important demand, these are the way to go. There are generally two types of engines associated with them: Four-stroke and two-stroke. These subcategories will determine the fuel mix that’s required to run the auger itself. Two stroke augers must be combined with one part oil and gas. The mixture burns a lot faster than four strokes, which only need ordinary fuel. Collectively, they are heavy, have a higher learning curve, must be cleaned and maintained on a regular basis in order to avoid damages. Electric – Electric engines work in the same manner as those with a reliance on fuel but utilize a battery instead, which must be charged prior to leaving with the machine. The primary advantage focuses on weight and 100 percent fuel economy since you won’t have to go out and purchase gas to feed the auger. Most models use ion batteries that will stay on from anywhere between 20 to 40 holes, depending on the model. Truthfully, they aren’t as reliable as fuel powered augers for this and tend to cut off at times when other types would run. And batteries aren’t as easy as fuel to purchase, so you’ll probably have to order or go to a sporting goods stores to get a new one. Most augers are going to be heavy no matter what, but manual models are usually the lightest. When evaluating a product, check out its specs to get a rundown on the weight. Also keep in mind that you’ll be hauling this to the ice by hand, so if you see a good model that includes a proper carrying handle somewhere near the top of the machine, that’s a plus. Augers must be weighted to allow the devices to pass through the holes you create, making it a necessary inconvenience. Drilling holes quickly are what everyone hopes for in an auger, along with low chances of engine and blade failure. Some types might be useful for only a day’s worth of drilling and require excessive work to clean up parts for use later in the future. Furthermore, pay attention to the craftsmanship of the inactive parts. Plastic pieces may break quicker than augers housed in fiberglass and metal. You’ll have to handle the former with more care so that nothing cracks when you’re on the ice. Even the most bare-bones ice auger will produce some sound. But one misconception is that fueled-powered types are always louder, which isn’t the case with every model. Of course, gas augers are loud in general but have become refined over the years to make less noise on the ice. Although it’s debatable, some fishers feel that loud noises can scare away fish and leave them swimming for a located that’s far away from where you’re stationed. Knowing this, stick to manuals if you want things to be as quiet as possible. To sum it up, safety should be the first concern when drilling. Doing it improperly can cause the ice to crack and risk damage to you and those in your immediate vicinity. There might be different ice fishing regulations that are dependent on your location, but as far as the machines themselves, the focus should be on making precise holes and not cutting yourself with the blades in the process. Always wear gloves whenever possible, and keep your fingers away from the edges, which are razor sharp. Most ice augers will product holes that are either eight or ten inches in diameter. Most products will inform you, in the name, as to what sizes are possible. For instance, a brand will display 10″ or “8 inches” on the label or description. Larger holes are preferred by some since the fish will be easier to pull up to the surface. But eight inches could suffice, especially if you don’t anticipate catching anything too large. 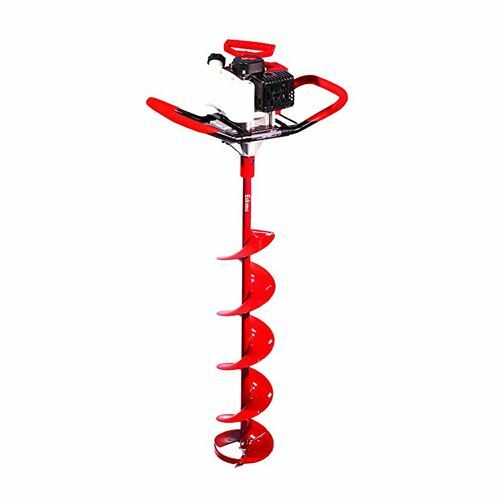 Augers are manufactured with plastic and metal parts. You’ll also notice rubber houses around the area where fuel is added. As previously shown, handling them too rough might causes parts to break off. At the same time, you shouldn’t have to worry every time you drop the auger from a short distance. Manuals will have strong grips that keep your hands from slipping as you turn the drill, while other should have coverings around the top that will protect it the interior components from snow and rainfall. Lugging an auger around by hand isn’t very fun. Their ease of mobility can be determined by weight. But also pay attention to the height. If you’re short, carry a tall auger might be overkill. And always look for models that include safety covering around the blades so you don’t rip anything when walking with the product. If you’re taking a four-wheeled vehicle with you on the ice, be sure that it will fit on the back portion with the rest of your gear. The blades will help get you into the ice, and closer to your catch. They will often be coated on the sides with paint that keeps ice from sticking, allowing it to come up as it makes it’s way further down. The most popular blades are Chinese and Europeans, particularly Swedish blades. Blades from Sweden are usually better in duration and won’t need to be sharpened after a round of multiple holes. Check to make sure the product that catches your eye is using Chinese blades. They are good but not to the same degree as those produced in Scandinavia. 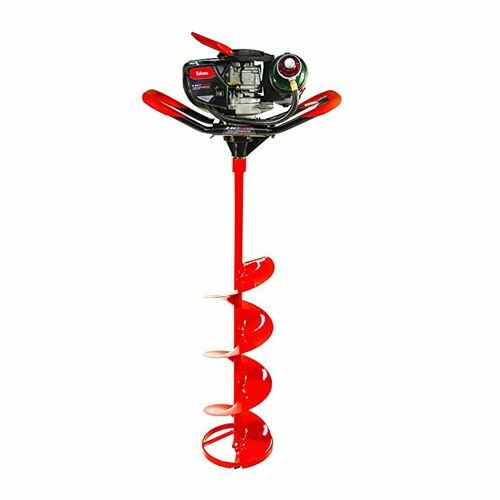 Once you know what auger is best for your ice fishing, see how to stacks up against the top picks on this article. The Eskimo High Compression and Sting Ray (the first and second reviews) win for being the best all-around ice augers for anyone. They are good for both beginners and experts, built with good quality parts that should hold up for more than one winter season. Still, if one of the alternatives retains your interest, then go with what you feel confident with. 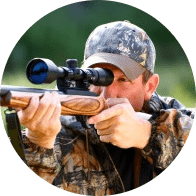 Ice fishing becomes easier when you have the right drilling product, so each brand listed will do a solid job at producing holes in an efficient manner.